Given the charge of creating a backdrop for photos with Santa Claus for Hope for Christmas (a charitable undertaking my church is participating in to help deserving families have Christmas gifts and food), I decided that Santa needed a sleigh. Found a sleigh online accompanied by a live reindeer (what could possibly be better than that??!!!) and I could rent it for only $2000. Way out of my budget range. Ebay had a few vintage/antique sleighs, some so wonderful I would have dug into my piggy bank to buy, even if they weren’t in pristine condition. But they were up North and “local pickup only.” I am in Georgia. I asked my kids to drive to Pennsylvania and bring one back. They asked how. Maybe a snow machine at the front of the car so that you could pull it home?? Finally gave up on that idea after a couple of days of watching Ebay auctions. Then I thought Santa could sit on his throne for pictures. Problem with that idea is that I couldn’t find a throne at all. Go figure. 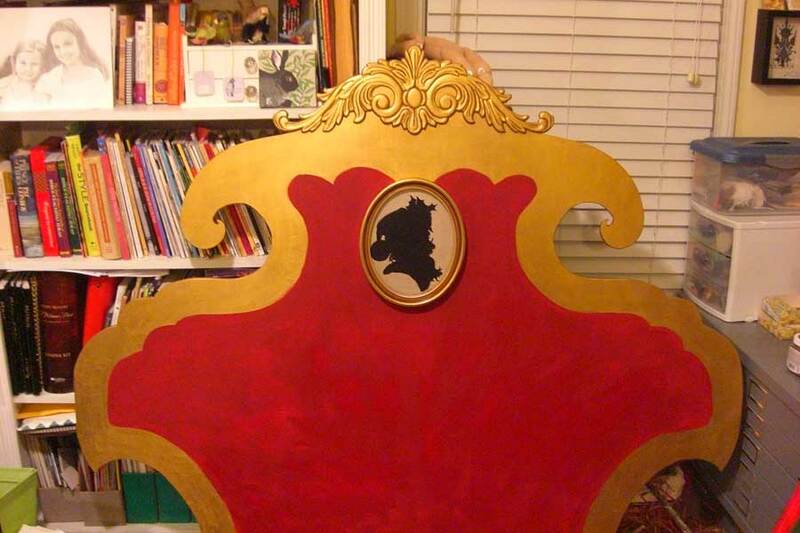 Below is a work in progress of me creating one with some help from husband and his jigsaw. Reality doesn’t always match the vision in my brain, but I am sort of proud of it. Thinking of upholstering it but do I really want that on my to do list at this time of year?! I think Santa will just have to lean against hard plywood but he will have a cushioned seat. You will have to come back after December 8th to see the final product. If you would like to contribute to Hope for Christmas, visit this site or this site for ways to help. That’s 4 coats of red paint and it still needs another! I pulled out black and white paper (you cut looking at the white paper, it is really hard to see what you are doing on the black paper). Just using the scissors (no drawing allowed! ), cut the profile of the person you are looking at. Even though I long ago lost my silhouette scissors, I was pleased to see that I am not so out of practice considering how long it has been since I have done this and I had to use a crafting pair of scissors. One of these is Ken, can you tell which? 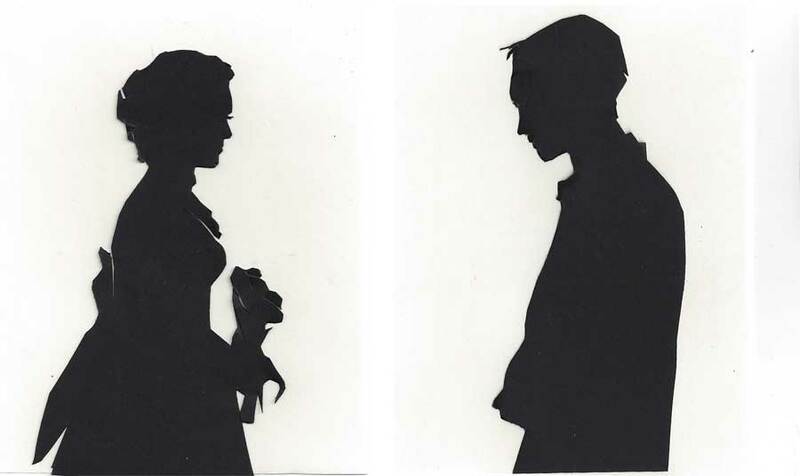 For fun, I cut a bride and groom silhouettes of my lovely young friends, Joseph and Adrianne who recently got married. These don’t really do them justice, but I thought they were so fun. Here is a bird I did a while back. I put it on an old photograph mount, wish I had more of those. 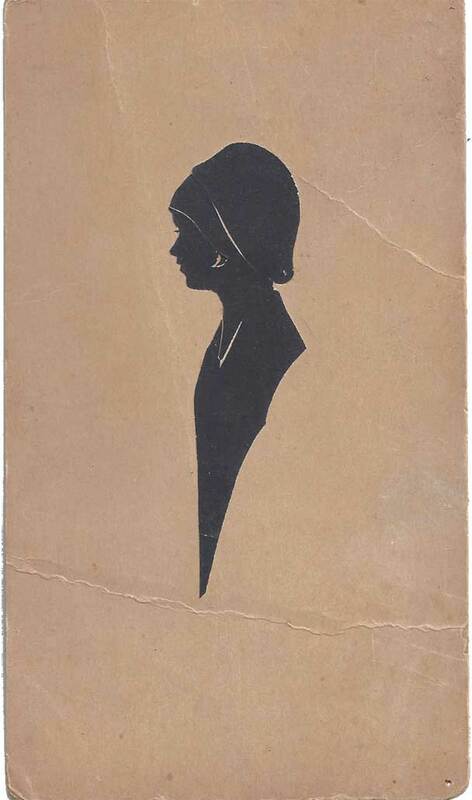 And here is a vintage silhouette I paid a dollar or so for. It is so small and very finely cut. Okay, so I am overly sentimental today in my post. I pray that 2010 brings you joy and contentment. But I often stop to wonder how thou canst go out so fast when thou comest in so slowly. Here is some cut paper done within the last year (or maybe two, time goes as quickly as money!). If you are awed by all the cut paper art you are seeing these days, it is easier then it looks. Draw your pattern on paper first, staple it (in the negative spaces) to the finished paper and cut with tiny scissors and an exacto knife. Avoid cutting away the stapled pattern until the very end. 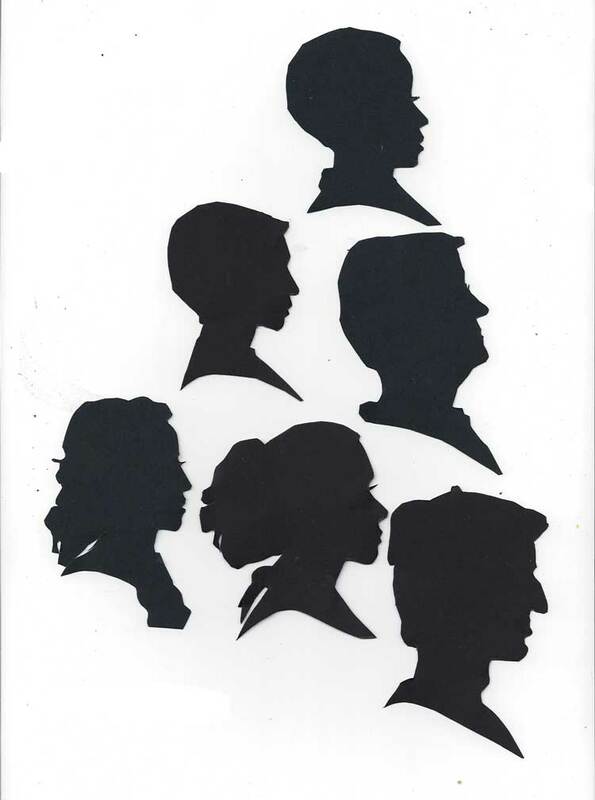 Use copyright free images and cut around them for great silhouettes. It isn’t always easy and it is frequently tedious, but most people could do it if they so desired. And cut paper is so tres chic! I would hope you would find my architectural work art were you to see it. We try hard but usually don’t have control over the final product. Have you ever thought about what brings you pure pleasure? I get pleasure from the simplest stuff. Paper, scissors and an exacto knife. Who needs rocks! One can model, fold and cut a piece of paper and create such works of art. These “ones” are especially able to do that. Take a look at their sites. Me, I can model, fold and cut and it is just pure pleasure and wholesome entertainment. Lately, I have been practicing cutting silhouettes so that I can begin my happy golden years sitting on the sidewalk at Disney World. 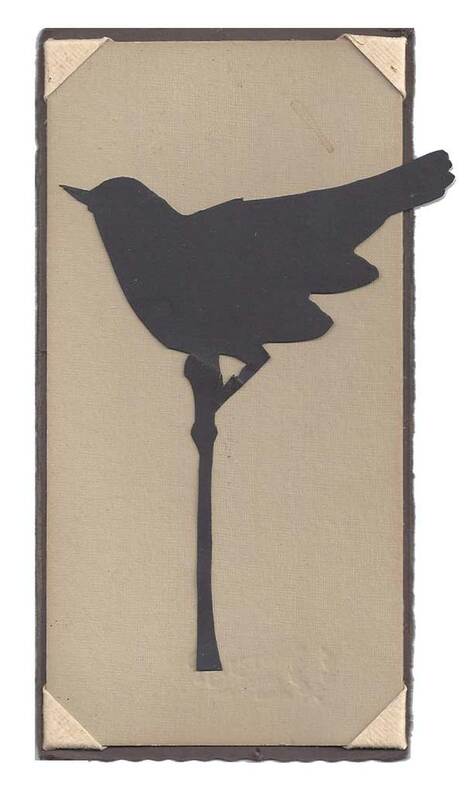 The traditional way to cut a silhouette is to take a piece of paper in one hand and scissors in the other and look at the the subject while cutting. No lamps or shadows are involved. I have cheated though and taken pictures of profiles to use for cutting. Digital cameras are wonderful for this. Delete the picture quickly after cutting and no one will know you have cheated. Here are a few of mine. They range from 2 1/2″ to 4″ high. Only 2,000 or so more to go before I qualify to apply at Disney World. Oh, and did you recognize Madame X in these?